LOCATION This stunning property is situated in the new Kilnwood Vale development, offering easy access to both Horsham and Crawley whilst also boasting immediate access to the A264 for Gatwick and M23/M25 to London. PROPERTY Accessed via a well presented communal Hall, with video entry system, the front door of this Second and Third Floor Duplex apartment opens into a large Hall/Study Area, which is the ideal space for anyone looking to work from home. From the Hall, stairs lead to the top floor and doors open to all other rooms including the WC. 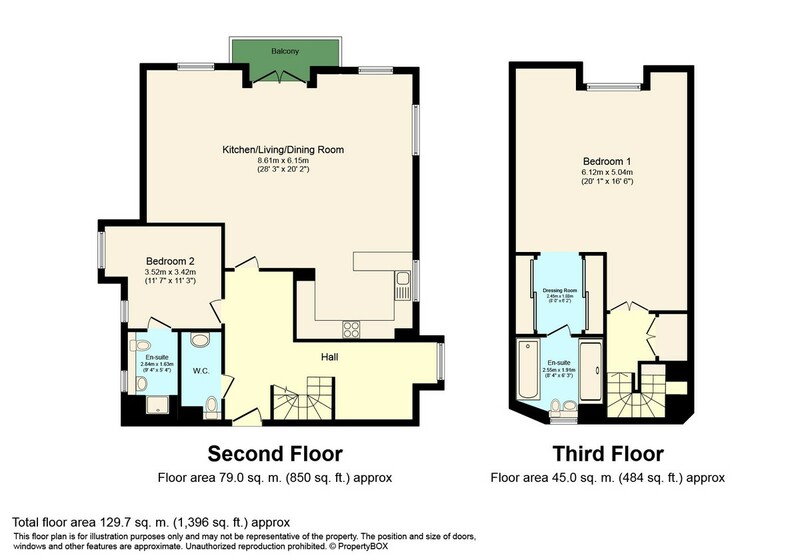 As you walk in to the stunning 28’3 x 20’2 (both maximum measurements) open plan Living/Kitchen Area, you will be amazed by the amount of space and natural light this double aspect room offers, with four windows and double doors spilling out to a private Balcony. The fitted Kitchen, with breakfast bar, boasts a range of integrated Bosch appliances, and leads through to the Living Room, and in turn Dining Area, which are the perfect spaces to relax at the end of a long day, or to entertain. Completing this floor, is a large double Bedroom, with a fitted Double Wardrobe and En Suite Shower Room with a window. To the top floor you will find a luxurious Master Suite with a Juliette balcony offering far reaching views across the well-kept grounds. This fantastic room measures 22’7 x 20’2 and boasts a Dressing Area with plenty of built in wardrobes, leading through to a striking En Suite Bathroom, which has a separate bath and shower cubicle. This incredible Duplex Apartment, really needs to be seen to appreciate the level of finish and amount of space on offer. OUTSIDE This impressive Duplex Apartment comes with an allocated, off street parking space, with plenty of additional spaces for visitors and a 10 year NHBC warranty. The property is surrounded by well kept grounds, which are well maintained and offers the ideal outlook from either of your private balconies.